Tuvalu, a state and Polynesian archipelago, is to many people idyllic. But its paradisiacal image differs from the real dangers of climate change. Despite a noticeable improvement of the children’s rights situation in the archipelago, it is not yet perfect. Progress concerning basic education and healthcare still leaves much to be desired and large development challenges must be confronted. 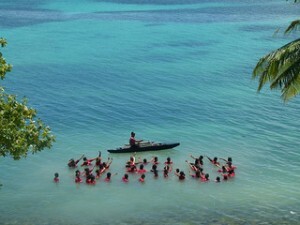 After the Copenhagen conference in 2009, Tuvalu became the international symbol of the consequences of climate change. 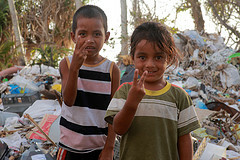 One of the main problems faced by children living in Tuvalu today is directly linked to global warming and rising sea levels which hit very close to home for them. They are the ‘children of climate change”: the first generation forced to face the very real possibility of losing their country when sea levels rise, which would make these children future climate refugees. 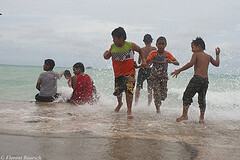 From day to day, the children of Tuvalu watch their beaches disappear. The waves uproot coconut trees on the islands and the coral reef deteriorates more and more. By 2050, according to some experts, the isles of Tuvalu will no longer exist. The reality that Tuvaluan children experience today is disturbing: drinking water is becoming rarer and must be imported. For their needs, Tuvaluans depend entirely on rainwater stores. At the agricultural level, the farming of traditional vegetables (pulaka and taro) is more and more difficult because the soil is more and more salinized. Sea levels continue to increase. Sicknesses transported by water as well as epidemics are more and more frequent in cases of flooding, from high tides or cyclones. The biodiversity is threatened, notably the coral reefs and marine wildlife. These fragile ecosystems must be protected to avoid the extinction of species. Moreover, the increase in temperatures of ocean waters risks the considerable reduction of resources of mollusks and fish. If one takes into consideration that Tuvaluans eat on average 500 grams of fish per person per day, a reduction of that resource would have disastrous consequences not only on the food source but also for the development of children. The climate change that is so commonplace to Tuvaluan children places the very foundations of human life in danger. It threatens their health and their natural environment by compromising their access to water, food, and land. The state of Tuvalu gears education towards development. Major steps were taken in favor of children since 2002, notably regarding the improvement of the quality of education. Education reforms started in 1991 with a few daring initiatives: the length of primary school passed from six to eight years; children would then receive an obligatory, secondary education lasting two years without having taken a selective entrance exam. Superior secondary education is accessible to those who have both the capacity and will to continue their studies. The course program was totally reorganized in order to ensure that the cultural values and language of Tuvalu were maintained and to find a just balance between the academic and technical disciplines. Tuvalu is divided into 9 isles and atolls. One can easily imagine the difficulty posed by the geography of an island in terms of the availability of teachers, buildings and materials. 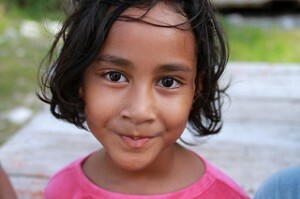 Despite that, in Tuvalu, education is obligatory for all children from the age of 6 to 16. Primary school there is free. There are twelve primary schools, nine free State schools and three denominational schools requiring the payment of a small registration fee. The standards and levels of literacy in primary schools vary strongly from one school to another. The causes of these variations are linked to the fact that the teachers are not always sufficiently trained, to a lack of resources, and to the lack of motivation in students and teachers. 83% of primary and secondary school teachers are trained in regional centers in Fiji, Samoa, and Tonga. Primary school in the capital is overcrowded: there are 630 children for only 19 teachers. Moreover, Tuvalu only has two secondary schools on the isles of Funafuti and Vaitupu, which means that every child living elsewhere in the country must leave his or her home and become a boarder. According to a PNUD report in 2011, the life expectancy at birth in Tuvalu is 67.2 years and the rate of mortality for children younger than 5 years old is 35 in every 1000 births in 2011. Some health problems remain an elevated priority because of the scale of their impact on society and more particularly on children. The increase in cases of diabetes in children and the rising negative effects from HIV and AIDS on families are two examples. Although there is very little absolute poverty on the island, major inequalities in family income exist throughout the territory. Children who come from poor families are the first to be affected by discrimination, school drop-outs and health problems. 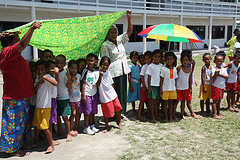 In Tuvalu, improving the welfare of children is not the concern of only one person, but a concern for all. One of the numerous challenges that Tuvalu must face is the just improvement of coordination between the different Ministries and departments concerning all of the questions involving children.